TOASTING 100 EPISODES. Tyler Haas, Travis Haas, and Jaycee Nauman Haas don’t fear going off on odd tangents in their podcast, Wisconsin Bound. ‘In my head, I picture people like us that find interest in humor and weird, fringe-y cultures and enjoy them by looking behind the curtain without being in a place of judgment,” said Tyler Haas, one of the hosts of the podcast sweeping the Midwest: Wisconsin Bound, a “small-batch comedy” podcast coming out of our backyard. The audience of Wisconsin Bound learned pretty early on that the podcast hosts wanted to explore every aspect of the human condition. With podcasts taking the stage as a medium for the masses, it seems like everyone’s got some skin in the game. Wisconsin Bound is hosted by Tyler Haas, Travis Haas (his brother), and Jaycee Nauman Haas (Travis’ wife). This podcast may be a family affair – Tyler and Travis are brothers and Travis and Jaycee are married – but that doesn’t mean it’s totally family-friendly. 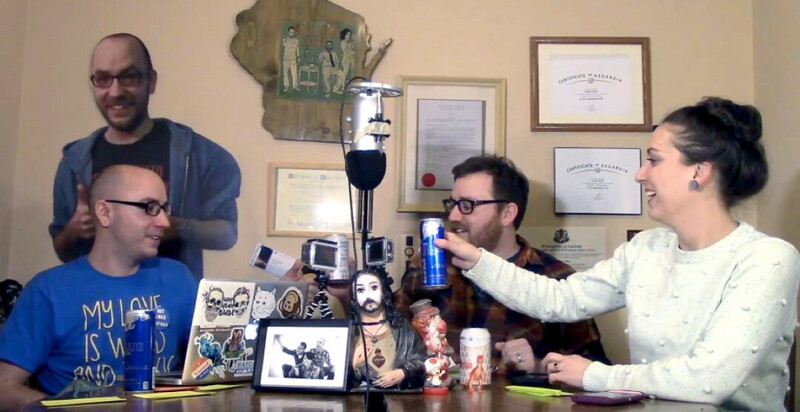 It features quick wit, hilarious non-sequiturs, and “everything you didn’t know you needed to know.” Originating here in the Chippewa Valley and by satellite in Madison, Wisconsin Bound is the hometown podcast that the Midwest needed. After more than 100 weekly episodes since its inception in January of 2015, it’s still going strong. The podcast started with an idea and a microphone, later involving Skype as Travis and Jaycee moved from the Chippewa Valley to Madison. The team has developed a structured system for their episodes that focuses in on weekly themes that can vary from the reasons why we hate Shia LaBeouf (episode 66), to a parade sheriff (episode 46), to a history of disintegration (episode 56), and cultivated a professional setup that grew out of their early MacGyver-ed setups involving a microphone from a video game system. “Themes are meant to get the discussion started,” Travis said. “We do our research individually, we all bring stuff that may be different from what the others bring to the table.” The team discusses whatever topics are under the larger umbrella of the week’s theme, but sometimes they wander off into the land of tangents that bring out the joking, conversational tone that one expects from each episode. These themes bring a slice of intrigue to their audience. Wherever you can listen to a podcast, you can listen to the Haases talk about anything you could possibly think of (and some things that you never dreamed of). Wisconsin Bound is the result of a conversation that many people have while having a drink with their friends: Wouldn’t it be cool if we started our own TV show or podcast? While a large portion of the population shrug off that comment with a laugh, Tyler, Travis, and Jaycee found inspiration in the challenge. You can support the efforts of the Wisconsin Bound team through Patreon. The podcast is available for listening through wisconsinboundpodcast.com, Apple Podcasts, Stitcher, Player FM, and other podcast platforms. An online comic created by Tyler Haas is available on tumbledrycomics.com.